Measures I.G. unit thickness in uPVC, timber, and aluminium windows and doors. Many uses. Specifically designed to eliminate mistakes during insulating glass unit fabrication. 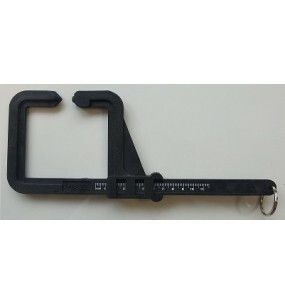 This Metric Insulating Glass Caliper makes it easy to measure I.G. unit thickness in sliding windows and doors. This useful tool features 101.6 mm (4") scale on each side for quick and convenient calibrating. Made of high impact resistant plastic for durability. An inexpensive way to measure insulating glass units or any other object where thickness dimensions are required. Adjustment can be made by turning screw left or right to show more or less of increment lines. The gauge clamps around the glass or frame and you simply read the measurement on the marked scale. Time saving and accurate. NO NEED TO REMOVE THE GLASS!! No more mistakes or guesswork - saves time. then slide the jaw closed until you hear the adjusting screw touch frame or glass, and read the exact thickness on caliper scale.